“Many people have approached me and said that they so much would like to take piano lessons or play the piano, but they don't have room for a piano in their homes. 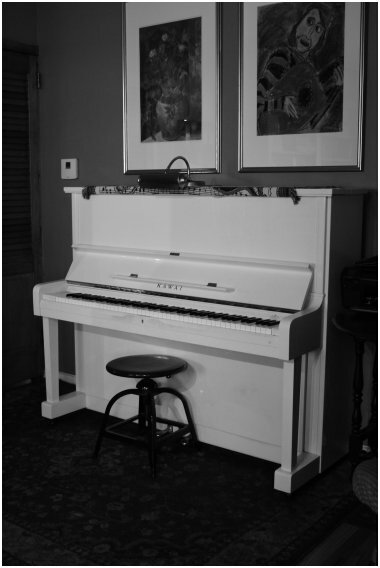 Of course for me, a piano is the first required piece of furniture in any home. But for those people who actually prefer to have the comfort of a couch and a bed in their homes as well, I am offering a service to help them make room for tune. It seems a shame for people to miss out on the enjoyment of such a beautiful and versatile instrument because of a perceived lack of space. My service helps with the personal organization and design of your space so that you can make room for tune in the best location possible for the optimum care of your instrument, keeping in mind the multi-functions of your room. My design experience began from personal necessity. When I first moved to Manhattan, I sublet tiny apartments and noticed that the tenants had somehow found creative ways to welcome pianos into their limited spaces. Then I rented a charming little bungalow in Burbank, California where the movers could barely fit a piano through the galley kitchen, but they did it! Since then we've lived in many other spaces and we've always incorporated a piano.